In search of: a rice cooking method that fits my family. We don't eat starchy dinners, but a scoop of steaming rice coaxes the picky eater to the table. Do I boil a whole pot at once, tempting my (diabetic) husband to dig in? Do I buy the quick cook rice and scoop out just enough? How do I weigh convenience and cost? After poaching chicken each week, I strain the hot broth and return it to the stockpot. Add 1 cup rice for every 2 cups liquid. Let the mixture boil, cover, and turn the dial to very low (or off altogether). Simmer until water is absorbed--about 14 minutes for white rice, 50 minutes for brown. No peeking! One less pot to wash, plus less energy to heat the liquid. I package small portions in freezer bags. If gummy rice remains at the bottom, I might stir milk into that same pot and serve this rice pudding as an afternoon snack. Rice cooker eliminates burned rice and saves time, if you have room and/or eat rice often. Baking brown rice saves energy when you already have something in the oven. Microwave according to package or your appliance's instructions. You can quick cook any rice in a pressure cooker. Alternative energy: rice in a solar cooker. I've had little success with crock pot rice. You'll find more great rice cooking instructions from readers in these comments! Pretty smart lady you are. Rice made with water just doesn't cut it for me, but with your broth idea ... now you're talking. Thanks for sharing your tips! Good idea. I'm trying to figure out how to do the diabetic thing for me without torturing my poor husband (he can still eat everything), and this could definitely help! I love this post. The baked brown rice is my favorite-- it tastes so much better to me that way. I love my rice cooker. I have a 10-cup capacity cooker that I use at least twice a week. I have teenage boys and it sure helps to have plenty of beans and rice on hand! I add canned beans to the rice and broth, seasonings, maybe a can of condensed soup or cooked meat. Thirty minutes later I have a cheap and easy meal for my voracious boys. I'm hoping to find a rice cooker this summer--if my cabinets can hold one more appliance! In the meantime, this big-batch/small bag method suits us well. In times past, we rarely ate starches. My husband and I were content with mostly vegetables and salads for side dishes. But with our growing family, we find rice to be a very economical way to stretch a meal! these are great tips!! Thanks for sharing! I love having rice on hand. Bag up some extra bags of rice, hamburger and beans, and in a quick second you can have burritos. I have a rice cooker, and LOVE it! It only cost about $30 at Target. great post - thanks. plus i loved the baked brown rice link. Do the rice cookers cook brown rice well? It sounds like you have found a great solution! Even though I have a rice cooker and really like it, I may try your method on occasion, too, especially for brown rice. I love this kind of post! I never, ever thought of cooking rice ahead and freezing it like that, and incorporating it with the poaching is brilliant! What works best when it comes time to serving the frozen rice? Microwaving from frozen, or thawing first, or some other method? 16yo son can never get enough rice, or rice often enough. Currently he's into brown basmati. I needed this post! We don't eat much rice here, but with those ideas I might cook it more often. Huh. I was surprised to read that you've had little success with rice in the crockpot. I'm curious--how big is your crockpot? I've found the crockpot the most consistent way to cook brown rice, but I use a small one. Not that Little Dipper size that come with some big crocks, but one that looks about 1 quart. That one always cooks rice beautifully. I'm just wondering if you were using a bigger crock, which maybe makes a difference. I've never tried rice in my 4-quart crockpot. You're so smart! I love rice cooked in chicken broth, and I save the broth from the chicken, but I never thought to cook the rice in it immediately like that. I finally bought a rice cooker a few weeks ago, and I'm in love! No more overboil mess to clean up. I confess, I am BAAAAD. I use the quick cooking rice most of the time. My husband too is diabetic. So I try not to make too much. We do love rice with beef tips and gravy. I also make a cheese and rice that the kids love. It is like baked mac and cheese except you use rice. My kids dearly love cheese and rice. I do make rice sometimes to use later in the week as a fried rice meal with the kids. A tad of chicken and some frozen veggies and a scrambled egg it is a quick tasty meal. Wow..thanks for the great tips...wow....I am going to print this! I am going to have to try this method. I always cook my rice in broth because the flavor is so much better. I am still experimenting with the best way to cook it. The boiling like pasta worked really well, but I haven't replicated that experiment again. 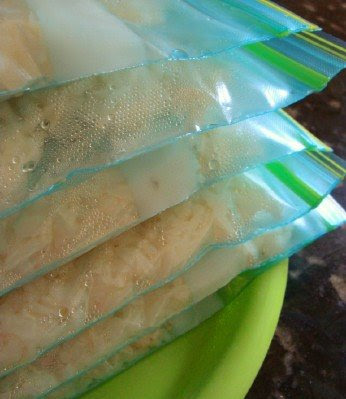 I am going to be looking at all of these great rice tips- such a fun and frugal side dish! We purchase our rice in 20lb. bags at Sam's, Costco, or superwalmart. It's much cheaper to buy in bulk and it easily keeps in a cool basement without going bad. Thi is such a great idea! I try not to eat carbs at dinner but my daughter loves them and there's no reason she shouldn't have them. This is an idea I'm going to use - and it's so frugal! Thank you! Baked Brown Rice is the only way to go for me - spray a dish, add rice, salt and butter, pour boiling water (or broth) over, mix, cover with double layer of foil and pop in the 375 oven for 45 minutes. It turns out perfect every time! Regarding the comment about making brown rice in a rice cooker - I have a friend who converted from white to brown and sold her rice cooker because she said it did NOT cook brown rice properly. A description of Julia Child's storage in her small Massachusetts kitchen inspired me to HANG appliances that are used weekly or less. Our basement stairs lead off the back of the kitchen. The basement is unfinished and utilitarian, if it were nice this would not be an option: along the stair walls I have neatly hung, on sturdy nails, the wafflemakers, cast iron skillet, bbq tools, hand mixer, cooling racks, handled baskets for taking meals, etc. Safety is not compromised, and precious cabinet space is spared. I have a close relationship with my rice cooker! We use it often! Currently I am in the process of switching the family over to all brown rice. Right now we are at about a 50/50 mix of brown and white. Thank you for the rice pudding link-looks yummy! That is a really great idea- thank you! This was so helpful, Meredith. I just love all your posts. Thanks for sharing your simple wisdom with the masses. I am big into cooking a huge pot of rice (ricecooker) and adding to my meat and freezing. Lots of bags ready to go for tacos and enchiladas. Saves me time and stretches my meat bill! We got addicted to rice while living in Hong Kong. I do not think we could live without our cooker. It cooks brown rice just fine. If rice is bland- use Jasmine or real brown from the orient. Remember that minute type rice is not really rice at all- but just the shell of it. No nutritional value. Meredith - this is great! My hubby and I are friends with the bride to be - but after NOT receiving an invitation, I cried at the news over the phone and tears are dropping even now - My feelings are not usually hurt easily, but this one is a big blow to my heart. Your blog helps me so much and I appreciate you - thank you for allowing me to vent. Anytime, Latrice! I would have had my feelings hurt, too. I hope you are invited someplace super-fancy so you can look fabulous and enjoy a weekend in style! Thank you for being a friend to me and this little spot on the internet. 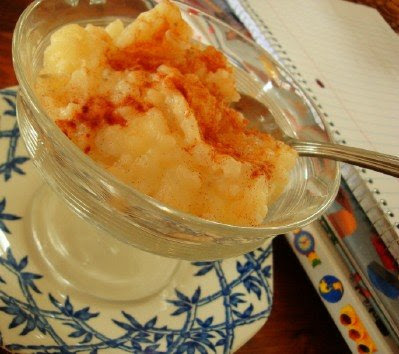 Just thought I'd share this great rice pudding recipe. I tried it to use up some leftover rice, and it was FANTASTIC!! LOVE my microwave rice cooker from Pampered Chef. So quick and easy! I love rice. I do have to comment about how to use after freezing. You can thaw it and eat it, but the texture will be off. So if you are planning on throwing it in a box lunch you should microwave it a little before putting it in, or before eating don't treat it as an ice pack. If you do it will be all gummy, and not good. Love the idea of cooking a large batch and freezing it. I'll have to experiement with that. We eat a lot of brown rice and I usually keep a tuppeware of cooked rice in the fridge pretty much all the time. Handy to throw some in whatever I need to to stretch something or for a quick snack for the kids. They love it cold, heated with soy sauce, scrambled with eggs (our family favorite...rice eggs!! ), some thrown in soup or tossed with veggies . I don't use the broth to cook it because we are vegetarian, but I do sprinkle some dried minced onion in as I add the rice to the water and it really adds a wonderful flavor!! Thanks for all the tips! !